Photo: Kieran Doherty/Oxfam. Foreign citizens are seeking refuge at UN bases in South Sudan. 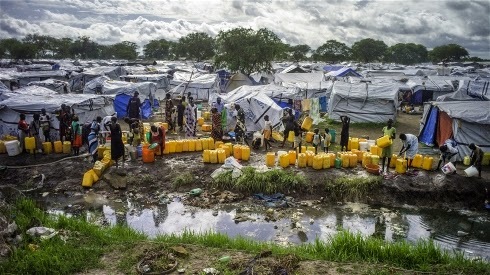 JUBA, 14 July 2014 (IRIN) - Among the 100,000 civilians holed up in UN bases in South Sudan since fighting broke out in mid-December 2013 between supporters and opponents of President Salva Kiir are several hundred citizens from Eritrea, Somalia and Ethiopia. Many have lost the means to resume their precarious lives in the world’s youngest nation, and so cannot return to their home countries for fear of persecution or imprisonment. The fate of the foreigners is an extra headache for government officials and relief agencies trying to assist nearly 1.5 million others displaced by the violence. Aid workers warn that famine will strike some areas of South Sudan in the coming months unless more humanitarian assistance is provided. South Sudan, which gained independence from Sudan in 2011, remains one of the world’s poorest countries. However, it had been enjoying an economic boom fuelled by oil revenues and international development assistance, and had attracted thousands of investors, traders and labourers from across eastern Africa. Many hotels and restaurants in Juba are owned by Eritreans, who are also said to dominate the water trucking business in many cities. Somalis are said to be prominent in supplying fuel. Officials say many foreign workers lack official residency or work permits, while the Commission for Refugee Affairs is still establishing itself. After fighting broke out in December, the governments of Kenya and Uganda sent planes to evacuate their stranded nationals. Uganda used the need to protect its citizens to partly justify its deployment of troops to secure the capital and prop up Kiir’s government. Sara Basha of the International Organization for Migration (IOM) said it had helped repatriate more than 100 other foreigners to their home countries, including many Sudanese citizens. IOM brought the foreigners to Juba, from where the evacuees’ embassies were responsible for their onward transport. However, she said some embassies lacked the funds to send their citizens back home. “So even if we bring them to Juba we are just moving them from one location to another and there is no solution for them,” Barra told IRIN. Many of those in the IDP camp at UN House, the world body’s main compound in Juba, say they have no wish to be repatriated. Simon Tesfazghi, a leader of the 250 Eritreans he said lived in the camp, said he had fled Eritrea in 2013 after seven years of gruelling military service. Another reason was that Eritrean authorities did not allow him to practice his Protestant faith freely, he said. Tesfazghi said it was unthinkable for the Eritreans to go back to their country, or to return to South Sudanese towns such as Bor and Bentiu, which were destroyed in the fighting and where foreigners had been harassed and robbed by gunmen from both sides. He said his community would like to be recognized as refugees and taken to another country. John Dabi, deputy commissioner for refugee affairs, said the South Sudanese government acknowledged that the Eritreans could not easily return home. The UN's top human rights body last month launched an investigation into alleged abuses in Eritrea, including extrajudicial executions, torture and forced military conscription. The USA has long listed Eritrea as a “Country of Particular Concern” for its “particularly severe” violations of religious freedom. Dabi said that after the crisis in South Sudan began he wrote to UNHCR, the UN Refugee Agency, proposing that Eritreans living in the UN camps be granted “temporary protection” while a mechanism was established to examine their individual cases. Under laws passed in 2012, South Sudan currently only recognizes refugees from particular areas of Sudan, Ethiopia, Democratic Republic of Congo and Central African Republic. But Dabi said the temporary protection plan was hastily put on ice after it triggered rumours that swept through the Eritrean and other foreign communities that they would be granted refugee status and resettled in the USA, prompting a deluge of new registrations at the camp. He said the plan to grant the Eritreans temporary protection would be revisited only once the Commission and UNHCR had established a committee to determine applicants’ eligibility for refugee status. But there were no plans to do this for Ethiopians or Somalis. One of the displaced, Farouk Kedir, said many of the 160 Ethiopians in the camp at UN House had fled to South Sudan for political reasons. He said Ethiopian authorities had left them alone while they were living unobtrusively in provincial towns, but that grouping them together in Juba had drawn unwanted attention. “Now that we are all together here, [it is easier to] follow us more closely,” Kedir told IRIN. He claimed that three people from the community who had ventured outside the camp had been kidnapped, and another killed by unidentified attackers. A group of four men had come to their section of the camp a month earlier and begun taking photographs of the displaced people, Kedir said. Residents challenged them and a scuffle broke out before the men fled. He said community leaders had reported their situation to UN officials, and asked the world body to take them to “any” safe country. Abdul Aziz Ismail, a Somali community leader, said there were 300 Somalis at UN House. He said some of them had been in South Sudan for over 20 years, having fled from the long wars racking their home country. Ismail said foreigners who left the camp tended to draw the attention of nervous South Sudanese security forces. The fact that many lacked official documents left them vulnerable to harassment, abuse and extortion, he said. Still, he said hundreds of Somalis had left the camp as the situation in Juba had stabilized, particularly those with businesses and support networks in the capital. Dabi argued that many more of the foreigners in the camps would be safe to do likewise. “Nobody is targeting them. They can go back to whatever business they were doing before,” he said. South Sudanese authorities had no plans to expel foreigners inside their borders, or to tax their business activities, he said. In the meantime, Dabi said foreign civilians should be granted the same assistance as displaced South Sudanese. While the focus is currently on protection, he said there were discussions under way with international partners about how to help people restore their livelihoods.